ABUJA--We at BIAFRA WRITERS can categorically confirm that at exactly 11:40am Biafra time, the case of the leader of IPOB, Mazi Nnamdi Kanu has finally been called up. Introduction of the Prosecutor(Deputy Director of Public Prosecution) and Defense counsels is now ongoing. Founder of Due process Advocates (DPA), Emeka Ugwuonye's presence is also made known at the court as part of the defense team. Barristers Ejiofor for first defendant, Innocent Adoga for the second defendant, Tolu Adefolani for third defendant, Maxwell Okpara for the fourth defendant, and another lawyer appearing for Ifeanyichukwu Nwaoha. Following the introduction of both counsels, justice Binta asserted that today's case is centred on application for bail for the accused and review of the treasonable felony charge bordering on terrorism, saying that such charge is a very serious offense. Reading out her speech, the trial judge, Nyako read out the positions and arguments of the defense counsel for the court to vary its order on the protection of witnesses. She read out that the defense based their argument on the change/striking out some of the charges but that she has not seen any further compelling evidence to do so. "Since he's on bail, no rally, no interview and MUST not be seen in a crowd exceeding ten people. “No interviews, no rallies, because if you breach any of these things, I'll recall you back,” Justice Nyako maintained. Part of the conditions was that he should provide a surety resident in Abuja with a landed property. She also banned him from filing any application in court as part of the conditions for his release. After reading out these very stringent conditions, and denying the other 3 accused bail, the case was adjourned to 11th July, 2017, for continued trial. This Nyako Binta is simply stupid. But she has failed already. She is intelligent by half. Its was targeted after our heroes' day. But sorry, it is going to be sit-at-home. Binta has missed it again. Very very stupid and animalistic in nature,thoughts and character.however,she should trade carefully with present generation of biafrans and most especially on this Nnamdi Kanu's case. Just look at frivolous order as if she is anything else other than a mere man not just mere man but a woman for that matter with little or no knowledge or qualification of her so acclaimed profession. We are watching.our leader can not be cow down by such stupid nonsense order pronounced by this illiterate woman who don't even know with common sense on how to handle court case. Reading through her order of pronouncement under which the bail granted to our leader based of health status must adhere to I was like who did this Fulani woman think she is? 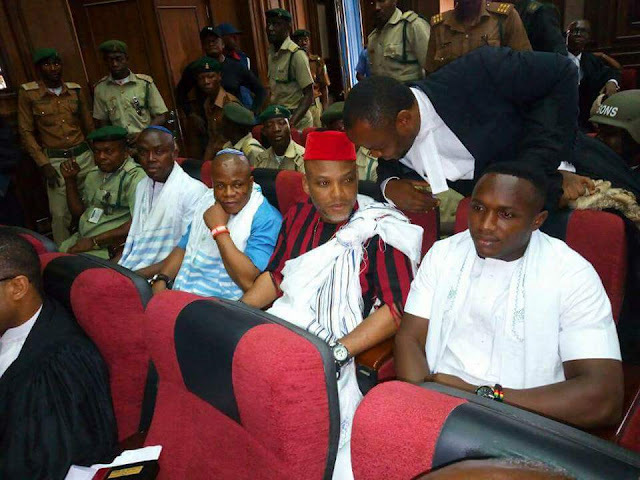 Trying to impose such frivolous order on our leader mazi Nnamdi kanu is an irony and an additional infringement to his human right of expression,that Nnamdi kanu must not do otherwise to her order.or else.this is nonsense.let them keep adjourning the case till infinity but one thing we are asuring them all is that Biafra is coming before their very eyes and nothing anyone can do about it.long live my dear belove brother and leader mazi Nnamdi kanu and his entire household.long live peace loving people of Biafra.all hail Biafra. Binta Nyako should stop further rubbishing the judiciary by these useless conditions and do the needful by discharging and acquitting these innocent men. It's a shame the level of injustice in Nigeria. This is no bail; it’s simply a tactic to keep Mazi Kanu incarcerated. Where is he going to find a Senator, popular Christian Leader and Jewish Rabbi to put a surety of N100m each and one with landed property? In addition, he cannot be in the company of more than 10 people. His family members alone will surpass that not to add friends and followers. Moreover, his British passport is seized. Where is he going to mention quality healthcare in Nigeria – a country with chronic health-care system. This is simply a ploy to keep him in prison. How long are we, Biafrans going to endure this oppression by the Hausa-Fulani? These people are taking us for granted. Enough of this foolishness. It’s time to end this game. We are not same people and we are hated so much in Nigeria. Justice Binta is a disgrace to the judiciary and she should be removed from this case immediately before hell break loose.